So these guys are playing a song that I recognized and I, knowing how music both builds and strengthens bridges, always have my harp with me. Since I knew (structurally) and resonated with (esthetically) the song they were playing, I sat – off to myself, but in their hearing and line of sight – quietly noodling to find out whether my harp was in the right key – how attuned what I had brought with me was to the tonal center of what they were doing. It was! So I started working out – again, at the margins – how I might be able to mesh with what they were playing. Had they not noticed me, I would not have been disappointed; it still would have been a profitable exercise in nailing down the changes and intervals. Very quickly (important for a good improviser) I figured out how they were approaching the song… the rhythm they were laying down, how they did the changes, whether and how they had “modified” the song from anything I’d heard before (because no one plays the same thing the same way). As it turned out, we meshed quite well. They heard and saw me, and invited me up. (Having been well-conditioned by Ukrainians, I waited until they waved me up the third time and joined them.) We were ready to jam. Later I was asked by one of the leaders of the World Evangelical Alliance’s Mission Commission, who was in attendance at the consultation, “How could you play so smoothly with them, when you’d never met them before and you aren’t even from the same countries?” Good question. 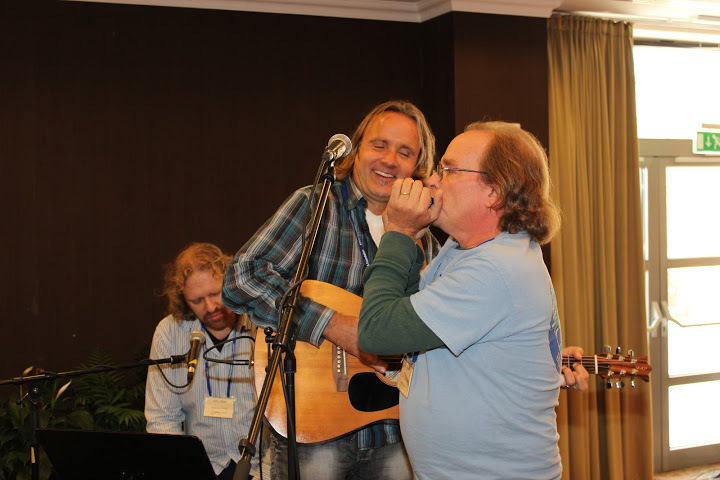 Here’s how: I could take what I was bringing – my distinct approach to using the harp to blend with songs in that key and of that particular type – and use it to blend with them. So first, I needed to be able to play (and play well) in order to have enough confidence to in my ability to not mess up. Especially when making a first impression, one can only get away with a very minimal number of “bum notes”… though, in certain forms of improvisational music, even a “wrong” note can become a “right” one, if the player can reconnect it with a figure that will tie back to the theme… actually some of the best, freshest improvisation can come from this process of turning “wrong notes” into right ones! Secondly, had I been a stage-hog and just sought to get up and hot-dog or steal the ‘spotlight,’ I would (and should) have been kicked right off the stage… no matter how “good” of a harp player I was. The idea is that this particular song should sound better (first, to the band, second, to the audience) because I had jumped in. And, to really build something good – so that they’d invite me up again (which they did), I had to make them sound better. But there is a difference between “making them sound better” and “feeding their egos.” The former involves working with them to better achieve their purpose in playing… to faithfully and creatively and compellingly (as defined by their audience, not themselves) PERFORM the piece (the essence of which they do not define) per their arrangement. My participation enables them to do this in an enhanced fashion. So what does this have to do with “doing theology” in a global missional context? Lots. BUT – do we “missionaries” burst onto the global scene with the truth as we understand it and just start to preach and teach “with authority”? It’s certainly been done. However, that would be like me, seeing a stage and a mike, grabbing both and playing “what I wanna play.” Ego-case rock stars do that sort of thing… but sensitive players won’t. 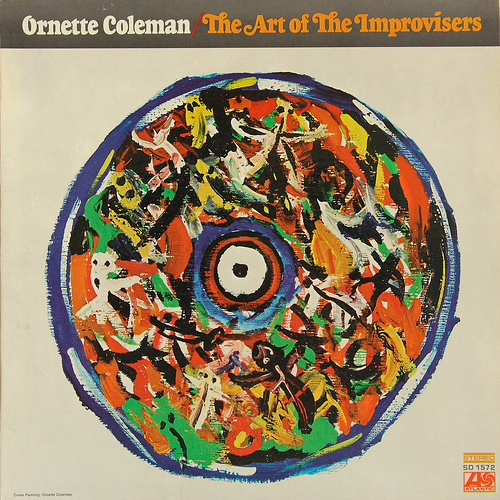 A good improviser will first listen, to pick up both the large contours and the idiosyncratic particularities of the particular piece, as well as discern whether, and to what extent, the players are playing it “straight” or adding their own “interpretation” to it. A good missional theologian will indeed be “quick to listen, slow to speak” (James 1:19). What is being discussed, in what terms? How does it relate to how well prepared he is both with the personal skills (the harp in the right key) and the sensitivity (knowing and appreciating the tune and its arrangement) to productively participate in the theological dialog at hand? The idea is to join in the conversation already taking place (assuming we are equipped to do so without creating an inappropriate level of dissonance) so that a) our dialog partners come off sounding “better” because of our collaboration and b) we both, together, succeed in “performing the piece faithfully”: in theology that means blending our thoughts, perspectives and voices in order collaboratively give s ubstance to that which the Composer has given us – maintaining an organic connection to the “tonal center” of His revelation, but doing so in our own voices – faithfully reflecting who and where we are. I am saddened when I visit a church in Ukraine and see a table full of thick, deep theological books and thinner works full of practical ministry advice… all translated versions of books written in English by Americans to American audiences. To me, that’s like us Americans, as a group, rushing the stage, grabbing all the microphones and playing what we’ve prepared. News flash: Every conversation currently going on in the world is not waiting for my voice. But I have been given a voice that is uniquely, providentially equipped to participate in some. Discernment, wisdom and a good ear are required so that we know when to take the stage, when to sit back and listen to figure out what’s going on… and when to position oneself near the “stage” in order to work things out. Taking the stage by force will get you thrown right out of a club. I think our global friends are too tolerant to throw us out for hogging the platform… but, all the same, I wonder what great theological improvisations are not happening because we are too busy keeping the center stage mike to ourselves. In the most cynical interpretation, might we be seen as paying (by virtue of our provision of needed resources) to get ourselves a spotlight that might be better given to other players? 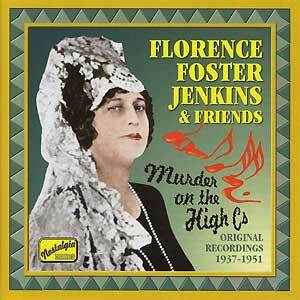 Do we really want to be the missional version of Florence Foster Jenkins (who apparently couldn’t sing, but could fancy herself a “star” largely because she could afford to pay audiences to endure her)? That’s all before we actually get onstage with the other musicians and start to jam. What happens once we start playing together opens up a whole new range of insights into the process of doing missional theology.